It is all happening on Wednesday Thursday 2nd from 3 p.m. until 8 p.m. so mark your calendars and RSVP today! We are taking out all the stops so that you can see everything we have to offer so that we can help make your dream wedding come true! We will have several of the hautest floral designs set up for you to view. 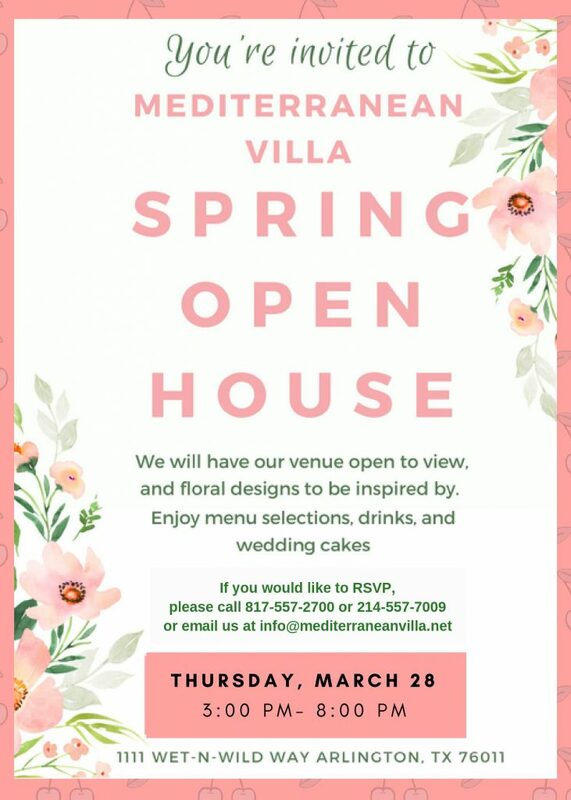 You can meet with our coordinators and our preferred vendors so you can tour the manicured gardens and beautiful ballrooms decked out in all their splendor. 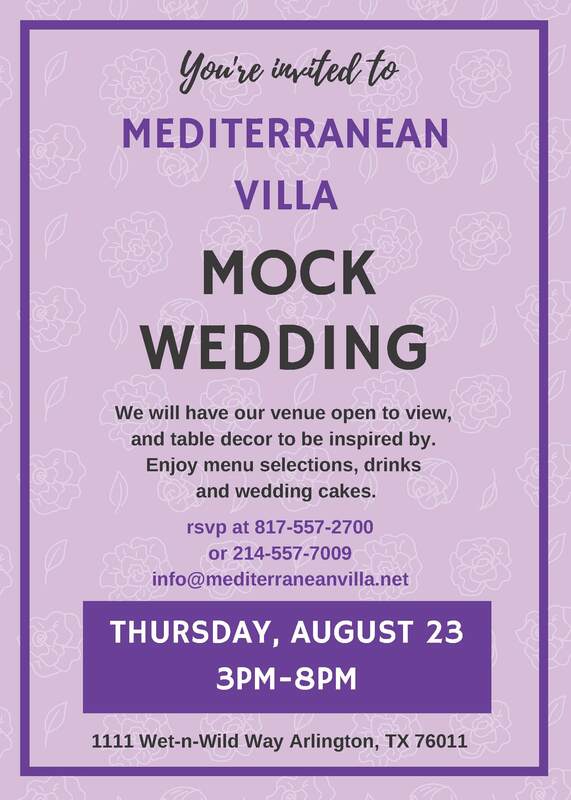 We will even have selections from our menu for you to enjoy as well as bride and groom cakes for you to sample too. 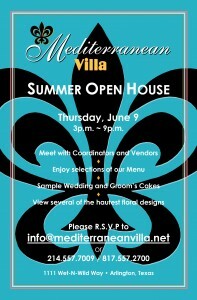 It is all happening on Thursday June 9th from 3 p.m. until 9 p.m. so mark your calendars and RSVP today! 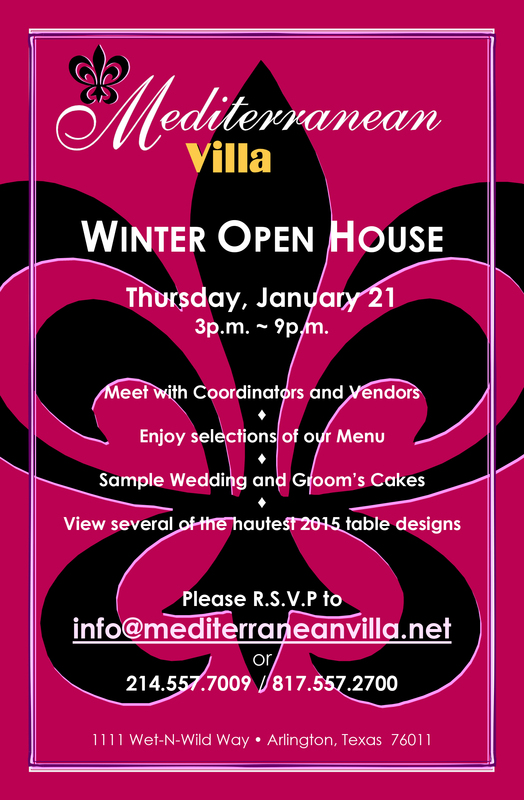 It is all happening on Thursday January 21st from 3 p.m. until 9 p.m. so mark your calendars and RSVP today! It is all happening on Wednesday November 4th from 3 p.m. until 8 p.m. so mark your calendars and RSVP today! 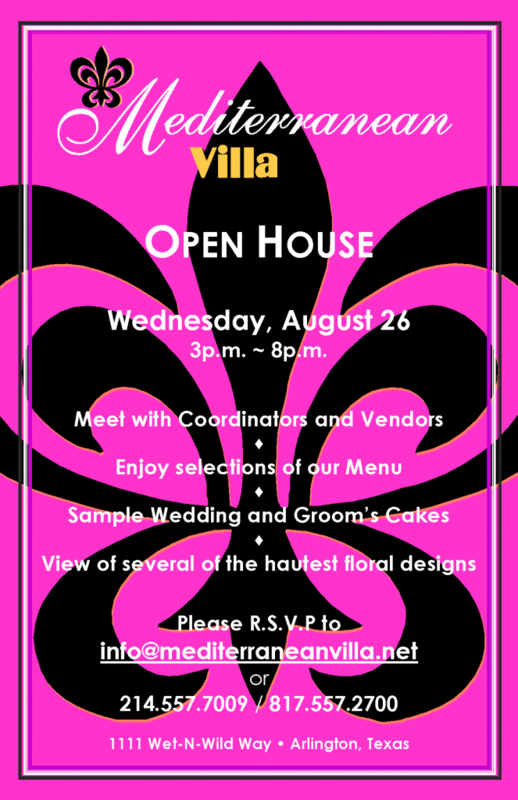 Open House at Mediterranean Villa – 8/26/15! 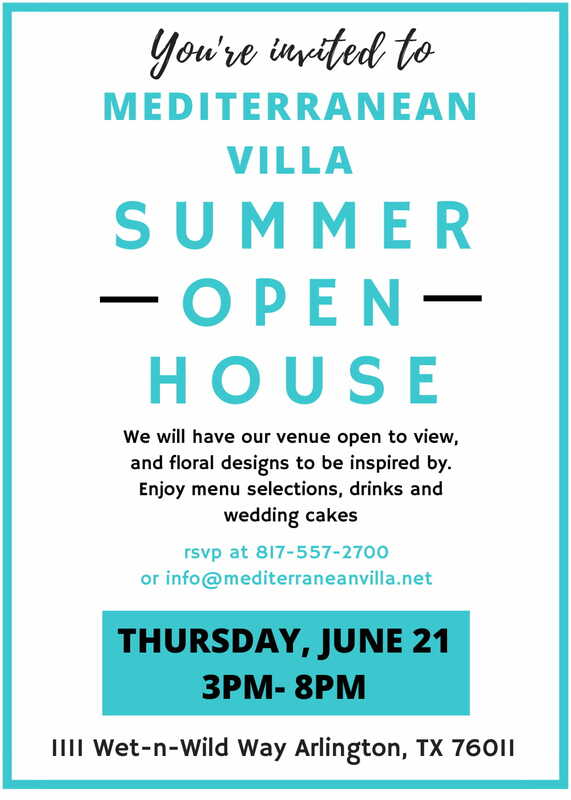 Please join us at The Mediterranean Villa for an Open House on August 26, 2015 between the hours of 3 pm and 8pm. Visitors will be able to meet with coordinators and vendors, try selections from our menu, sample wedding and groom’s cakes, as well as view several floral designs. 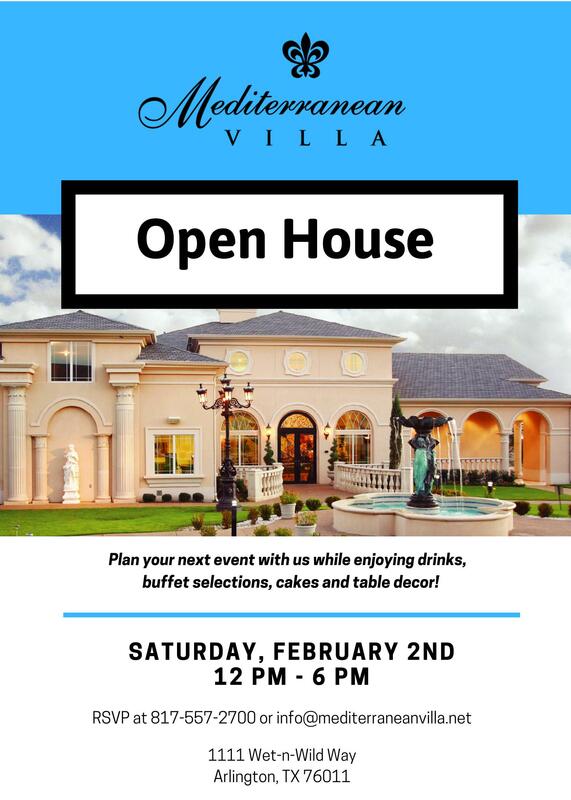 Please R.S.V.P. 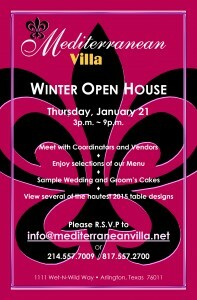 to info@mediterraneanvilla.net. 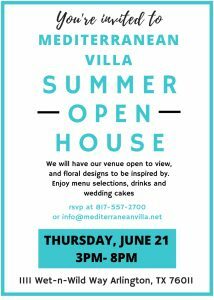 You can also call to R.S.V.P. 214.557.7009 or 817.557.2700.